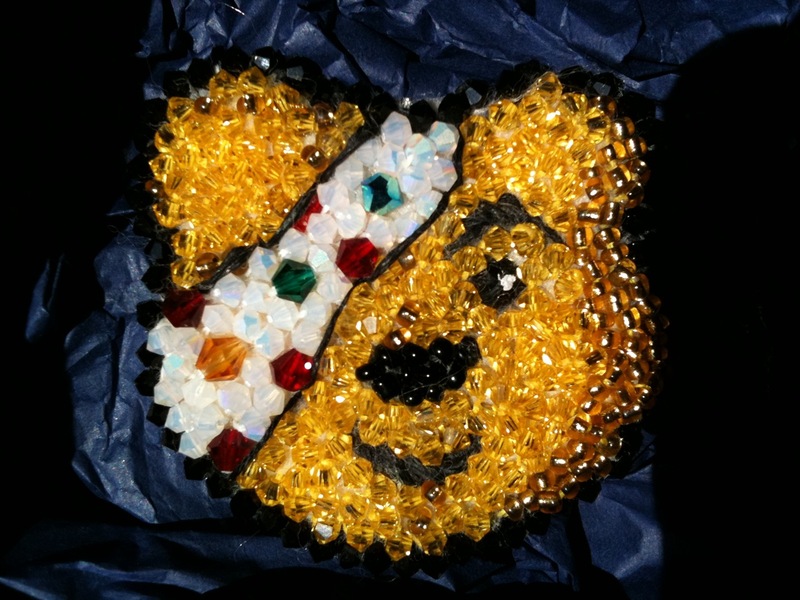 The auction for my beautiful Pudsey brooch has now ended and we’ve raised (drum roll)… £303.33 for Children In Need. I want to say a huge thank you to everyone who bid for this unique brooch and all those who spread the message on social media to help us raise money for this fantastic cause. The auction had over 1000 views which was amazing! Of course it would be wrong of me to be completely upbeat at a time when the world is uniting in grief at the atrocities in Paris. But the actions of these barbaric fundamentalists has once again highlighted amazing acts of kindness, generosity and solidarity from communities across the world as we come together to offer support and love to those affected by this senseless tragedy. I, like millions across the UK, was sat watching Children In Need on Friday night when I was abruptly stopped in my tracks by the developing tales of depravity in Paris as innocent people going about their Friday evenings with friends and loved ones were being brutality killed. The world was weeping but tales of human nature at its best started to emerge as Parisians opened their doors to help those in need. At the same time, whilst we watched in horror from the UK – people proved that those who try to shatter our freedom and community spirit will never win. Despite the ongoing tragedy, the nation came together to raise more than £37 million for Children in Need, a record-breaking amount. It is testament to our resilience and sense of unity that we can still seek light in the darkness to help those less fortunate than ourselves. And I am proud that we have helped to play some small part, so thank you to everyone who showed their support. I’ve always tried to do my bit for charity and, with Children in Need just around the corner, I was trying to think of how I could help. And then it came to me – why not use my unique and beautiful Pudsey brooch to help raise funds for this fantastic charity? When you think of Children in Need, the image of Pudsey Bear and his bandaged eye is probably the first thing to spring to mind, and my one-of-a-kind brooch is a beautiful representation of the charity’s much-loved mascot. It was created by a very talented long-time friend of mine, Kleshna (www.kleshna.com), who I have known from way back during my previous life in advertising and marketing before I took over Dodo Pad. She’s since made a quite a name for herself on the jewellery scene and it was the Pudsey brooch that kick-started other charity creations of hers, including stunning Swarovski ‘Kleshna poppy‘ brooches to raise money for the Royal British Legion that have been proudly worn by celebrity superstars including Emma Watson, Dame Judi Dench, Simon Cowell and Cheryl (before she became Mrs Fernandez-Versini) Cole. Anyway, back to Pudsey…Kleshna ran a low-key email campaign among friends about eight years ago to bid for this totally unique, one off Pudsey brooch, made up of hundreds of Swarovski crystals, to raise money for Children in Need – and I bid the most and won! Then in 2010 my beloved Pudsey almost got his shot at TV stardom when a famous TV personality/presenter agreed to wear him during the live broadcast of Children in Need. Sadly, his TV career was never to be, due to a contractual agreement with her stylist. BUT, I’m determined that this year will be his – and I’m asking our lovely Dodo Pad fans to spread the word. I am auctioning off my Pudsey brooch on eBay, with 100% of the winning bid to go to the charity. He’s only ever been worn on Children in Need day, spending the rest of the year nestled in his presentation box. He has no special dietary requirements – in fact, he’s pretty much the perfect pet, as bears go. With your help, we can find this beautiful Pudsey brooch a new loving home and raise much-needed funds for this fantastic cause at the same time. You can bid for him here on eBay. The auction ends on Monday 16th November at just after 7pm. Please keep sharing and sharing again and let’s get him on the telly! Want to meet Lord Dodo at the 2015 Cornwall Macmillan Christmas Fair at the Eden Project next week? Lord Dodo is about to don his pinny and dress his stall at his annual Christmas charity fair outing to the Eden Project in aid of Cornwall Macmillan. On Wednesday 11th and Thursday 12th November, Cornwall’s largest and most vibrant Christmas Fair aims to raise the largest single amount for Macmillan in Cornwall this year. For two days the Eden Kitchen, between the two Biomes, will play host to a twinkling and glorious selection of Christmas gifts, home accessories, stocking fillers, clothing, jewellery, food and drink and there will be something to suit every taste and budget. There are over 50 different stalls so if you live in or near Cornwall (or even further away! ), please join us for a magical event that hopes to raise the most ever for this wonderful charity. The Eden Project is very generously offering FREE ENTRY for all visitors on Thursday, so tickets only need to be purchased for the Fair itself. All proceeds, including 15% of all stall-holder takings, go direct to Cornwall Macmillan Cancer Support. Preview Event Tickets are £25.00 and include supper and wine, preview and shopping! For tickets please follow the link. Thursday Tickets are £15.00 and include a light lunch, shopping and FREE ENTRY access to the entire Eden Project for the day! For tickets please follow the link.